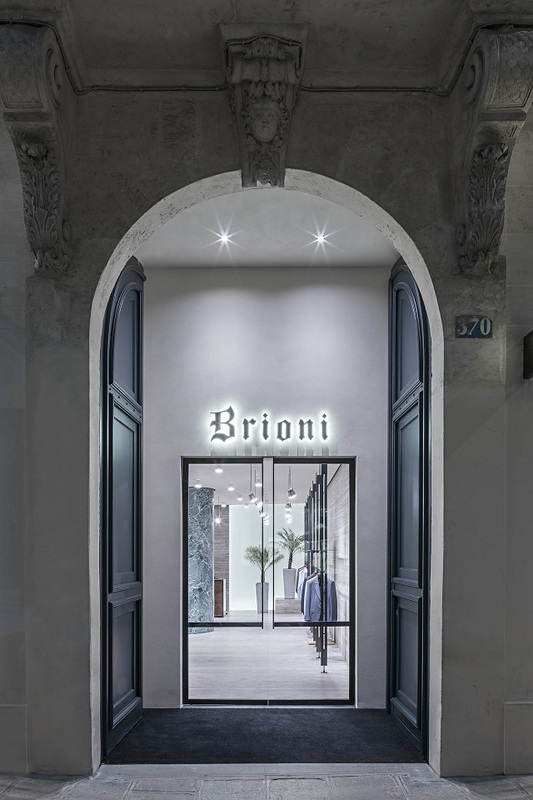 BRIONI announced the opening of its Paris Flagship Store recently. 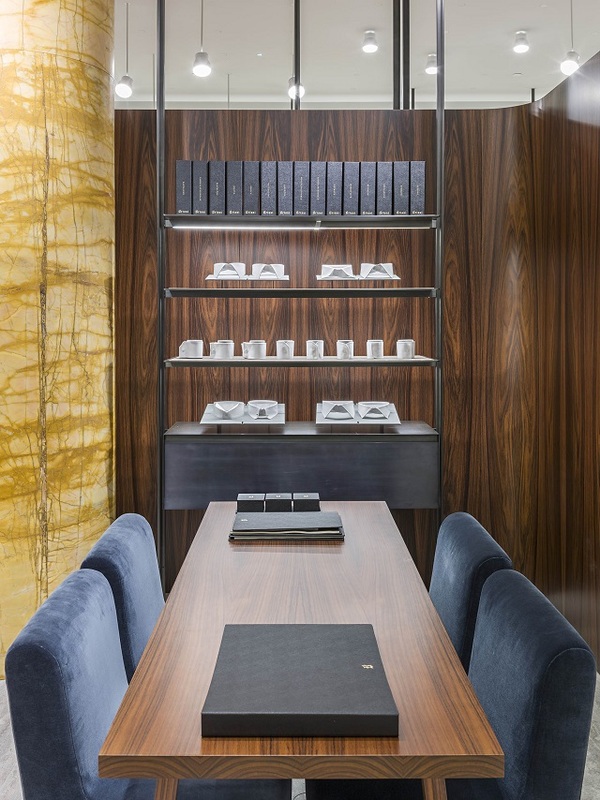 Situated at 370 Rue Saint-Honoré, the 590 square meters Flagship marks an important step in the development of Brioni’s retail network expansion and the debut of the new Store Concept developed by David Chipperfield Architects Milan in collaboration with Brioni. Depicting the contemporary essence of Rome where Brioni heritage, its roots and its tailoring tradition merge with the present and the future, the store emphasizes the new brand vision under the creative direction of Justin O’Shea. 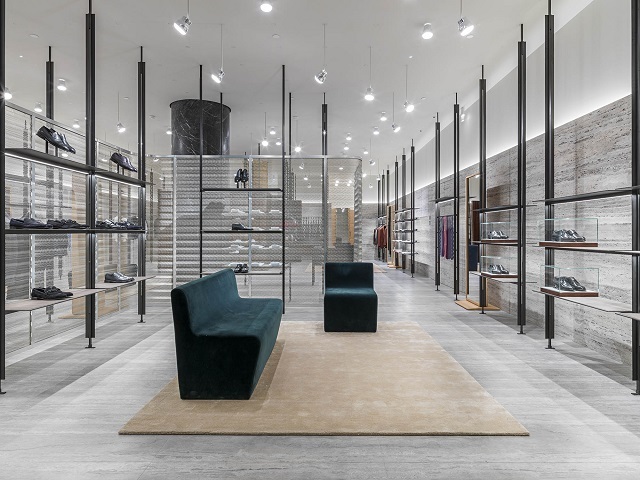 The general approach of the new Store Concept treads a fine line by adhering to a contemporary sense of quality while using classic materials. The challenge of the new Store Concept is to offer a different way of interpreting men’s clothing and, in parallel, to propose a new way of men’s shopping through creating both a “gallery of clothes” and a “destination point”. 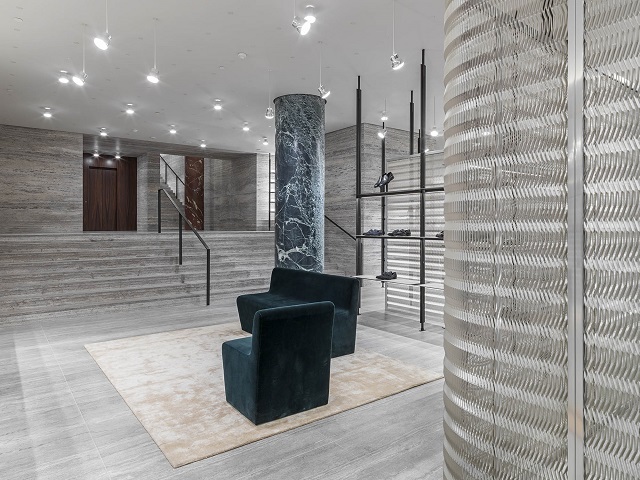 The Store has strong architectural qualities and is made of grey travertine, also known as the “lapis tiburtinus” - a clear reference to ancient Rome. The compact calcium carbonate travertine flooring and walling can serve as a memory but also a distinguishing mark for the brand with “one foot in the past and one foot in the future”. The intention for the Store Design is to generate two feelings: the feeling of openness with natural light coming in through windows on the ground floor level, and a contrasting feeling of enclosure at the basement floor level. The two levels are linked through a giant stage-like staircase that allows the basement floor level to be perceived from the ground floor level, enhancing the sense of spatial continuity between the two. The new Store Concept proposes three areas: the main store area; the VIP area, which includes a fitting area; and the changing area. These areas are conceived as a continuum space, defined by the change of experience and ritual rather than by the change of materials. The idea behind the store area is that it can be partitioned in such a way that it can be explored by customers but closed off when needed. The metal meshing is very important for the store design, this solid but transparent material make the store space different, giving a sense of perspective and allowing the customers to see through. The idea behind the store display furnishing is that it should be adaptable and flexible, positioned in such a way that the store architecture becomes the background of the products. The floor to ceiling gunmetal bars are very important for the design, these slim but strong element make the store modifiable, giving a sense of lightness and allowing the products to stand out. 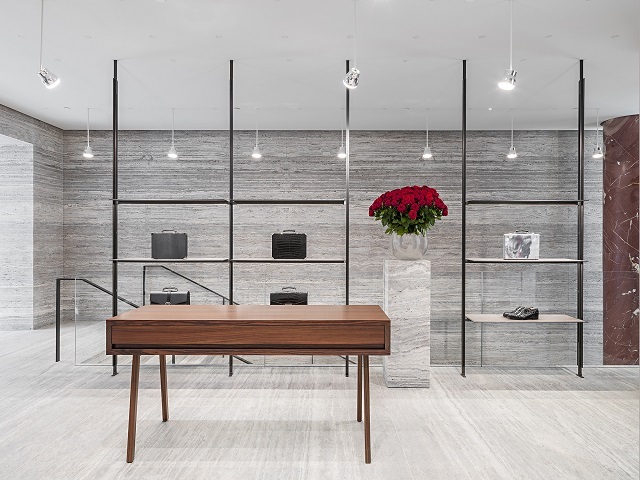 The Store Concept clearly refers to and recalls one of the master architects of the 20th Century - Mies Van der Rohe both in terms of aesthetics and its rich simplicity.